She wasn't fond of my mowing yesterday. Yes, the ground finally dried enough here in Lawrence, KS, to crop the jungle that had sprung up in the last few days of warmth. We went directly from winter (snow a week or two ago, freezing nights just a few days ago) to summer, and the grass has been exploding upward, unevenly, such that the yard looked like abandoned property. No more! If no one's in the kitchen when he does that, he starts leaping onto the screen - a rather noisy event that even gets my attention while working upstairs in my office. 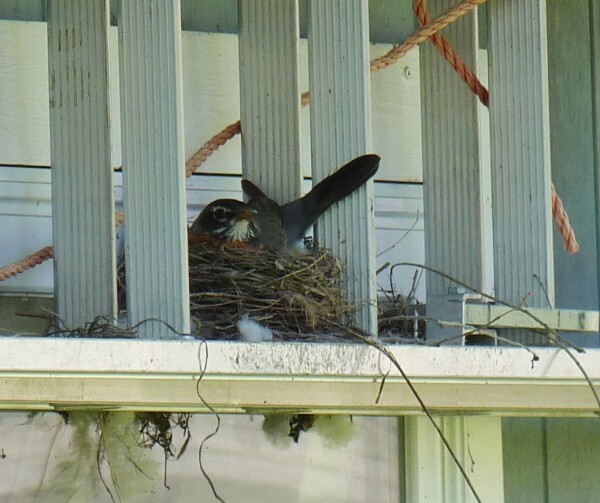 Well, now a young male and a pregnant young female have learned how to get more food, faster. I would like to think that these intelligent little critters have learned from one another a rich survival technique that their behavior earns reward, but I suspect it's more along the lines of they have trained the humans how to respond. Apologies for the rare and intermittent posts; this semester has been killing me. So much work, so much unnecessary work-stress, so much prepping for Science Fiction Summer... yowza, it's almost May! Yesterday, when I got home from an all-day English Department strategic-planning meeting, I saw a dead squirrel. Someone had driven over it. This was distressing, because I've gotten attached to several neighborhood squirrels. Also, if one of these poor bastards is going to die, it should be in the talons of a hawk or something, not a senseless death beneath the mindless wheels of a car. When I parked my scooter, I picked up the little dead thing from the road and placed it in the grass beneath a tree in front of my house. It was still warm, flexible, but very dead. I spent a few seconds examining it to see if this was one of the regulars, my "outdoor pets," but it showed no markings I recognized. I wonder if its siblings will perform another squirrel funeral like they did last time. And then, this morning, I witnessed another little urban-wildlife tragedy. A few days ago, I put a big, clear-topped, metal live-trap on my back porch. See, I've apparently been breeding mice by feeding the squirrels and birds. Baby mice are about some of the cutest things you'll ever see, darting out of cover just long enough to fetch a seed, than darting back under cover like a furry lightning-bolt. Heck, I've even made videos of the tiny things, and will share them soon. Just need to upload. This morning, I saw that the live trap caught two little mouses since I checked yesterday. One had been dead for a while, the other had just died and was cuddling it, nose pressed on top of its dead sibling. When I was a little boy, especially before I started school or in the summers, I would often stay with Grandma Vi during the day when my parents were at work. I always looked forward to spending time with her. She was so kind and patient, letting me play with Matchbox cars all over the floor, or take apart old clocks or other things so I could figure out how they worked – even if they never did again. Grandma Vi taught me to paint when I was barely old enough to hold a brush. I remember once, while she was doing rosemaling on the kitchen cupboards, I sat at the table and painted scrap pieces of wood in a similar style. One of these is still around somewhere. It says, "Violet is very beautiful." In the hot summer when I had trouble falling asleep, Grandma would sometimes gently brush her fingernails along my back, giving me goosebumps so I felt cooler. It was such a comfort. When I discovered she had played the accordion, I was so proud! It seemed like such a magical and complex instrument that surely she had to be a musical genius to be able to make that thing work. Most of my earliest memories of Grandma Vi and Grandpa Harvey together were of them laughing and chasing one another around the house. She would laugh and say, "Oh, Harvey!" then giggle and swat at him. This ritual often ended with them scurrying off to the bedroom. They seemed so happy together. I still think of that as a model of how two people in love behave toward one another. In other news, I'm still SWAMPED with new-course development. Sorry I've been away for so long! Now I've got to get back to work. You probably noticed that there's no new lower control-arm in this photo side-by-side with the old one, like with the upper control-arm and the cross-brace. You'd be right. I also noticed this. But not right away; instead, I only noticed when I was setting up this shot, six months after ordering the parts... and failing to notice back then. Oops. A few emails and some calls with Summit Racing resolved the problem, which was that the manufacturer simply failed to ship them! Now they're on their way, and Summit is even reimbursing me the $40 price-drop since when I ordered the parts. I love Summit! Not only do they have great selection and prices, but their customer service rocks. Finally, today is Hadley Rille Books' 7th anniversary, and they're celebrating with 99¢ Kindle and Nook e-books for a limited time! Hadley Rille's specialties are SF, fantasy, and archeological - check 'em out! It's also publisher Eric Reynolds' birthday. As a gift to himself in 2005, he fulfilled a long-time dream of starting a publishing company with Golden Age SF: Tales of a Bygone Future, a fantastic collection of short fiction - and it's still available. This is one of the things I love about this publisher in particular but the small press in general: As long as there's still demand, the books remain in print. Because Eric is such a great guy and Hadley Rille is such a cool business, I went with him to publish my first novel - and several short stories in a variety of collections. Click the cover to see more about the book, links, sample chapters, and more. Now it's back to grading. I seem to say that a lot. Friday will be an all-day The Galactic Adventures of Jack & Stella write-a-thon, and Saturday is slated for working on the Chevelle, at least for part of the day, and then maybe going to see the new "Life of Pi." This is always a blast. Picked up a pile of graphic novels (and an awesome T-shirt of John Brown, Superhero). Later that week was the "Weird Edition" of Super Nerd Night at the Jackpot. At 4:10am on Saturday night (or Sunday morning, whichever you prefer), the doorbell went off. Being a light sleeper, I woke instantly, if not clear-headedly, heart pounding within my ribcage, wondering, "WTF?!" A few seconds later, it rang again. Worried that a friend was in trouble, I set about searching for pants (found some stretchy shorts in the dark), glasses (no luck), and dagger (beneath the pillow, natch), and then headed downstairs. This is when the doorbell began ringing in eanest, as the visitor pressed it repeatedly for at least a dozen times. Now my concern turned to irritation and a bit of worry, because my friends wouldn't do that, would they? Downstairs, I found my phone. No missed calls, so not a friend. Unfortunately, the front-door motion-detector light was turned off, making it tough to see outside very well (no Moon, either), so I inched the front curtain open. The doorbell-ringer had left. Whew. Just then, I heard the back sliding-screen door open. Here's when I went all HOLY CRAP INTRUDER! The ensuing adrenaline cleared out any remaining sleepiness. The back-yard motion-detector light on the garage was unplugged, I learned later (probably my own fault from turning it off with a long stick), and the back-door light is switch-only (and off at the time), so no light back there, either. I peeked around the corner in the kitchen as the man - a little taller than me, I judged, and wearing bulky clothing - tried to open the sliding-glass door. Because of last year's adventure with locking myself out (this involved a drill, lock-puller, chisels, hammers, Sawzall, and such), the back door doesn't have a lock but is instead blocked; ironically, this is much more secure than a simple lock, so the door only slid an inch or so before hitting the rod in its runner. He put his hand INSIDE THE HOUSE, searching for a chain or something, I suspect, then pushed the door again. Pissed off now, I turned on the overhead kitchen light. The intruder-dude CONTINUED TRYING TO GET INSIDE. Unfortunately, the sliding-glass door is virtually impossible to see through when it's dark outside and the overhead is on inside, so all I could see was a hand. CREEPY. At this point, it was time to go upstairs and fetch something more menacing than a dagger. In the back bedroom where I store the menacing stuff, I discovered that, naturally, chernobylred had slept through all this. I turned on the light, informed her what was going on, found what I was looking for, and went back downstairs. En route, I also found my glasses. When I reached the kitchen, he had left. chernobylred, being more level-headed than I, asked, "Shouldn't we call the police?" Uh, yeah, good idea. Ahem. They arrived within minutes. A cruiser rolled past on the street out front, lights off like a land shark, while another pulled into the alley with lights everywhere. Two police walked the alley with flashlights as bright as the sun, and another walked through my yard. The intruder was gone. I gave them my report and discovered that they had found a suspicious man nearby on a bicycle. Of course I couldn't give any description, but if that was him, perhaps he'll be more cautious in the future. As in, NOT TRYING TO BREAK INTO HOUSES. My theory? The doorbell-ringing was to find out if anyone was home. If someone meek had answered, he might well have busted inside for nefarious purposes, but I bet he'd have run away. I think he wanted to find an unoccupied house, break in, and steal stuff. I wish I'd gotten a good look and we could finally catch - assuming it's the same guy that's been robbing neighborhood houses - this serial burglar. I'm double-locking the doors now and sleeping with more-substantial equipment within reach. Oh, and now all the outside motion-detector lights work. At last Thursday's Write Group, I finished a new piece of writing. My first sub-1000-word work in a long time! Now some polishing and off it goes. Oh, and is coming along nicely. Over the past week or two I've written another couple thousand words. Best of all, I worked out parts of the plot-arc that were shaped more like nebulae. Also wrote a scene for the next book in the trilogy (I think it'll be three...). Since the KC RenFest opened three weekends ago, I've gone three times! Different goals each time, naturally, with next time being a group trip to the Barbarian Battles region, where I intend to pummel my friends with foam swords. This last weekend, I caught a whole bunch of shows and finally rode the bungee-trampoline. HOLY COW was that fun! I aimed for the sky, and reached a good 30 feet or more toward it. The combination of trampoline below and gnarl of bungees attached to each side of a climbing harness = HUGE AIR. I leaped so high that the bungees were actually pulling me down, and upon hitting the trampoline, I sank in knees-bent several feet before it launched me back up. A MUST-DO BLAST FOR ALL! This was a day when I intentionally wore jeans, not the kilt. Ahem. I was working in the garage today and discovered that one of the sticky traps I put down in there to capture horrid things like Brown Recluse spiders had captured what looks like a baby Brown Snake. It was still alive, but barely moving. Only about eight inches long, thin as a pencil at its thickest, with a teeny pointed tail and wee face with long, black, nervously flicking tongue. It was stuck upside-down on the glue trap, face first, looking like it was trying to eat the cricket stuck there. Click the image to see the Great Plains Nature Center's website. I felt so bad! I looked up how to humanely free a critter from the trap, and it seems that vegetable oil will do the trick. So I trimmed the glue trap down to near the snake, then drizzled olive oil (the only oil I could find in the house) along both sides of its body. I set it down in the shade in the grass upside-down so that the snake would be upright, then soaked the back (paper) of the trap, too, thinking it would loosen the glue faster. Went back out after an hour, and the snake is gone. Hooray! Go free, little Brown Snake, and eat bugs and snails! Sorry I haven't posted much in the past week. I've been busy with teaching, writing, and so forth. Hope you're well! Just dropping in for a moment because 1) I'm still alive, and 2) I HAVE TO SHARE SOMETHING FANTASTIC! 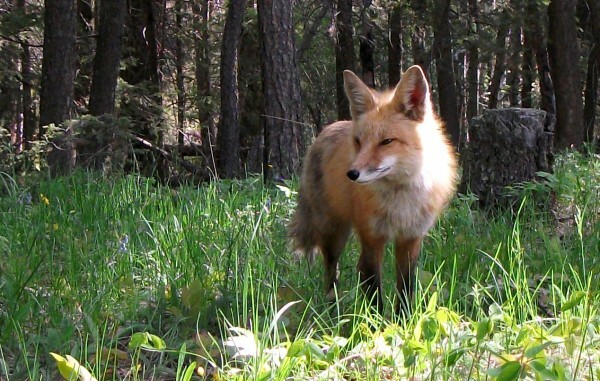 On my way home tonight from the CSSF summer program's scholarship hall, a fox trotted across the road in front of me. I slowed down and pulled over, only to notice that this one little fox had joined up with THREE OTHERS! I've been seeing them almost every night. They look much healthier and larger than they did last year, and their tails now display big red poofs of fur in the middle. Life update: Yes, the Workshop is a wrap, and it was just wonderful this year. Two writers from Canada, one from South Africa, and several from across the USA brought unique writing styles and critique POVs, and it was a joy. Tiring as all get-out, but just great. The Campbell Conference in its new digs was lovely, our guests charmed all and the attendees had great conversations, and everyone made it home safely. Right now the SF Teaching Institute is underway, and the discussants are so lively that just a few questions keeps us going for three hours... and then into dinner and lunch the next day. Pics to come of the events. In summary: Hooray foxes! Hooray SF! Tree frogs: loving this Kansas spring. The tree frogs in the back yard are DEAFENING. Wow, what a crop this year! When I first heard them, just a few years ago, I thought they were some kind of mega-voiced insect. But as they grew more vocal, I though no way could a single bug make that much sound. A couple of years ago, I happened to be talking with a herpetologist who asked me to make the sound (which I only barely can, a super-fast high-pitched warble), and he declared it a tree frog. Apparently, they can go through their entire egg-tadpole-legged life cycle in 24 hours, given nice deep rain puddles. Viola! Frogs inland from water, like charming, noisy mosquitoes. They might wake me, but I much prefer them to their winged counterparts. Just finished the massive task of updating all my class syllabi, websites, handouts, online readings, and so forth for the coming semester. This included at least 10 hours of converting legacy Word .doc format syllabi to more-useful and appopriate Web .htm format... which made my eyes bleed. 'Nuff said. Getting over a little flu. I love being healthier overall, when "I have the flu" means "My nose is runny and I feel a little weaker" for a day or so. Last weekend, I installed a couple of solar-powered motion-detector lights to illuminate the dark areas of the back yard. More on that in a moment. Last night I rewarded myself for a 12-hour day by watching disc #2 of the Star Wars saga (I refuse to call it "Episode 2"). It was much cooler than I remembered, not nearly as irritating as disc #1, and very pretty. Gorgeous sound, of course, what with this being Lucas and all, who frakkin' invented modern movie sound. more visits from the coyote; every time I went for my camera, it would turn and trot away. As soon as I moved to within ten feet of the sliding-glass door, it would trot back out into the alley. It stood about two feet at the shoulder - didn't know they got so large in town! Or that they even lived here. Wow. About 30,000 words into my next novel, The True-Life Space Adventures of Jack and Stella. And I just emailed all the students in my large classes with links to their syllabi and online resources. All set for the semester! Squirrels are not well socialized. There's this charming little squirrel I've named Spot (because he bears a light-colored spot on his back; clever, I know) who is not terribly afraid of people; in fact, when we toss seeds onto the back patio (in response to his begging), he doesn't run away but instead waits while his siblings dash off to safety. In fact, Spot seems as if he wants to come inside. Lately, I always close the garage door behind me when I enter. This scene takes place several times a day: Spot climbs to the top of this fencepost, right outside the kitchen window, and looks cute and globular in an attempt to get more handouts. It usually works. Most often, he trundles up to the back door, a sliding-glass affair, and peers in as if to say, "Hungry out here. The seed is gone. More please!" When the dumb humans fail to heed his call, he finds other ways to get our attention, such as this. He also climbs the wall and gets on top of the back-yard floodlights, so as to reach eye-level and peer inside. "Ahem. Hungry!" Clever boy. Because I'm an optimist and a fool, today I decided to try something new. Holding an almond in my outstretched fingers, I opened the patio door, knelt down, and made the universal tongue-smacking-feeding-time sound at Spot. He nervously hopped around, looking at me, at one point uttering a chittering sound with his teeth. I think it translates roughly as, "Stupid human. Just drop the almond and no one gets hurt!" Of course I didn't listen. Eventually he decided to take the almond. Now, don't think Disney-princess interaction here, imagine something more along the lines of Cujo. Yup, charming little Spot leaped onto the back of my hand and then jumped away, skittering around a bit until coming to rest a foot or two away from my now-scratched-up hand. "Warned you, buddy. Now drop it." I tossed him the almond and closed the door. Moral of the story? In the immortal words of Guy Fleegman, "Of course they're cute now. But in a second they're going to turn mean and ugly somehow and then there are going to be a million more of them!" Yeah, maybe I won't continue my efforts to hand-train ungrateful little Spot. In re: the charming photo: This scene takes place several times a day. Spot climbs to the top of this fencepost, right outside the kitchen window, and looks cute and globular in an attempt to get more handouts. It usually works. Most often, he trundles up to the back door, a sliding-glass affair, and peers in as if to say, "Hungry out here. The seed is gone. More please!" When the dumb humans fail to heed his call, he finds other ways to get our attention, such as this. He also climbs the wall and gets on top of the back-yard floodlights, so as to reach eye-level and peer inside. "Ahem. Hungry!" Clever boy. 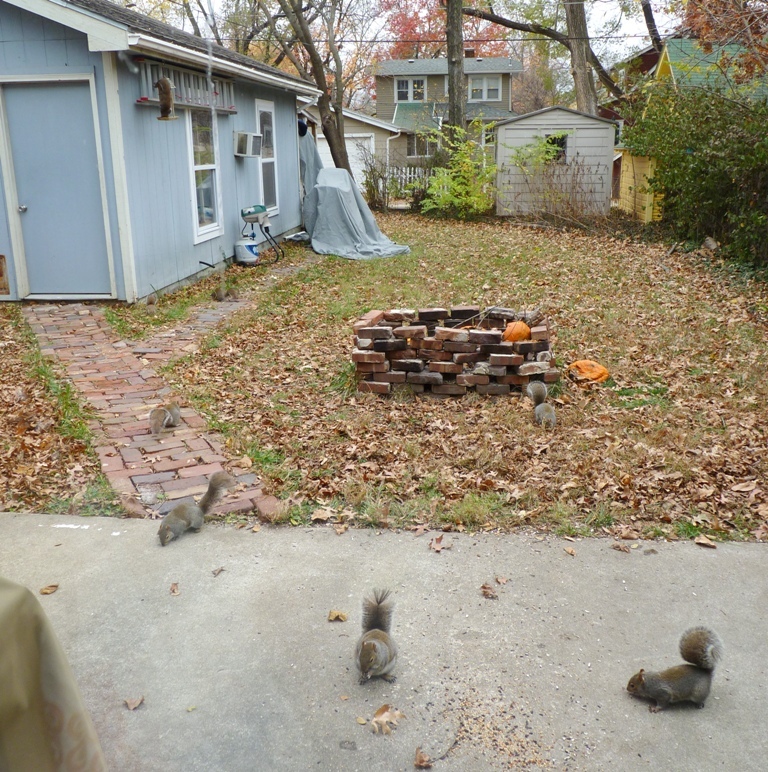 Ten-squirrel party in the back yard. A few minutes ago, I had ten (10!) squirrels eating the seeds I put out this morning! This might be a new record. I didn't even know that many lived in my yard. Every day is a party at Casa del McKitterick! Click the image to see more wonderful photos by Chris Buzelli. What do you think happens next? What's in there? Is this curious squirrel about to embark on an adventure into places we can only imagine? Is this the transformational moment in Squirreldom? I love this guy's art, how each piece suggests an entire story, usually something magical. I discovered Chris Buzelli because of the art he painted for Kij Johnson's creepy new story, "Ponies." If you like this piece, check out his galleries. 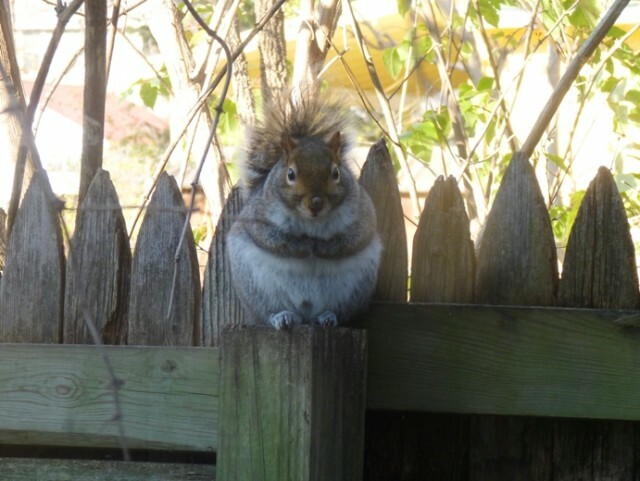 This pic is from photo_squirrel, and it might as well be from my front yard. The squirrels in my neighborhood love that my neighbor has new grass seed on the ground: It means she has to water every day, because August in Kansas is hot and mostly rain-free. So squirrels 'round these parts are rubbing their bellies in the mud to cool down! Wheeee! Stubby-tailed vacuum squirrel is back! Hooray! I was getting worried. Note that, unlike other squirrels, he just sort of hoovers up the seeds rather than pick them up and nibble. It's pouring rain outside, and this little fella is nibbling clover and dandelion leaves. I love bunnes: Almost no dandelions have reached adulthood because of their appeal to bunnies.